Decrease the demand for water. The best way to decrease the demand for water in your lawn is by using native plants! These plants are already used to the natural water supply, so they won’t require more than what is already available to flourish. Lots of things can cause sprinkler heads to become obstructed, which can cause water go to the wrong place or spray unevenly. So it is important that you correct any obstructions. Regularly inspect your sprinkler system. You should check for clogged heads, broken heads or leaks at least once a month. Zone your yard. 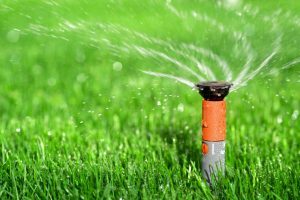 Not all parts of your yard will have the same watering needs. Shady parts will need less water, while sunny parts will need more. Reduce evaporation by watering when the sun is low, it is cooler outside and there is little to no wind. If you water in the middle of the day, you could lose up to 30% due to evaporation. Understand when your lawn needs to be watered. If your lawn bounces back up after you step on it, then it doesn’t need to be watered. In fact, watering too much can actually cause weeds to grow and the roots of your plants to be shallow.